This demo surveillance video demonstrates day and night time infrared capability of the BIPRO-S600VF12 Outdoor Infrared CCTV Camera. The BIPRO-S600VF12 is an outdoor CCTV camera that supports 960H CCTV resolution and 1080P HD resolution using AHD technology. This video demonstrates the 1080P AHD resolution. The room that I'm testing in is 29 feet wide by 28 feet deep. Although this is an outdoor security camera, I am testing indoors so that I can simulate a zero light environment. When the camera is in daytime mode, you can see that color video is captured at 1080P resolution. When I turn the lights off, the camera engages it's infrared night vision mode so that it can record video in zero light. I used the light on my iPhone just so I can make my war around the room. This is 1080P high definition video using the camera's built in IR LED's. You can see that the infrared technology that is built into this camera does a good job at illuminating this entire room. The infrared on this camera is actually a little strong for this distance, and works even better at longer ranges. When I turn the lights back on, the camera disengages the infrared mode and changes back to daytime color mode. This security camera allows the installer to select the video output to be an analog CCTV, or analog high definition mode. The supported analog CCTV resolution is 960H and the AHD video resolution is full 1080P high definition. The 42 in front LED's that are built into this camera support IR illumination up to 200 feet. The 2.8 to 12 millimeter lens allows installers to adjust the angle of view to be ultra wide, or more zoomed in and narrow. The tri-axis mount allows the security camera to be ceiling or wall mounted. The IP66 weather proof housing is designed for outdoor installation. 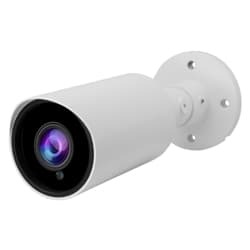 CCTV Camera Pros supply this camera for home, business, and government use. For current pricing, and to learn more please visit www.cctvcamerapros.com/s600vf12. Thank you for watching. Click here to learn more about the BIPRO-S600VF12 Outdoor Infrared CCTV Camera used in this video.